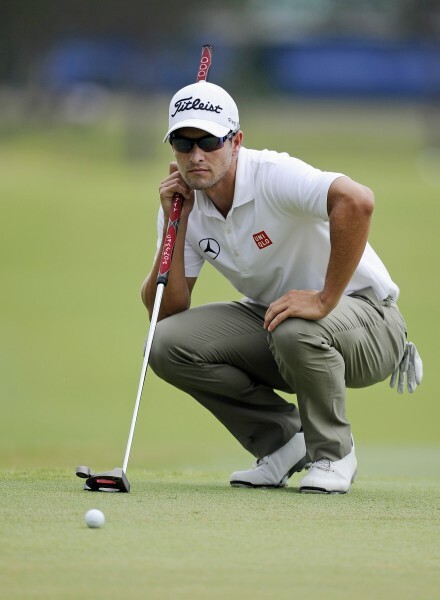 IN 2012, Adam Scott lost the Open Championship at Royal Lytham and St Annes. In the first round, Adam fired a brilliant six-under par 64 to equal the course record and it was virtually error-free golf for the next 50 holes. Entering the final round, he led Graeme McDowell and Brandt Snedeker by four and eventual winner Ernie Els by six. With four holes to play, Scott had a four-shot cushion and looked home. But on the 15th he pulled his approach shot into a greenside bunker and made bogey. On 16, he over-hit his approach shot to the back of the green and three-putted for bogey. From the centre of the 17th fairway, Scott again over-hit his approach, which landed in thick rough. He pitched out to seven metres, missed the par putt to record his third successive bogey. Meanwhile, Ernie had birdied the final hole to take the clubhouse lead at seven-under par. Adam needed a birdie at the last to win or a par to force a playoff. He found a bunker off the tee and was only able to pitch out sideways. His third shot was brilliant and left him with an eight-footer to force the playoff. He narrowly missed and Ernie grabbed the Claret Jug. Others have had the Open within reach, but faltered and had the title ripped from their grasp. These are some of the other near misses. At Carnoustie, Garcia held the lead after each of the first three rounds and carried a three-shot lead over Steve Stricker and a six-shot lead over the rest of the field going into the final round. He extended his lead to four shots, but bogeys at the fifth, seventh and eighth proved costly. On the final hole, he needed a par to win, but failed to get up and down from the greenside trap. Padraig Harrington edged out the Spaniard by one stroke in the four-hole playoff. Bjorn led Ben Curtis, playing in his first major, by three with four to play at St George’s. The Dane bogeyed the 15th and then took three to get out of a deep greenside bunker on 16. He then bogeyed the 17th to gift the American victory. The Frenchman only needed to double-bogey the final hole at Carnoustie, but he had a major meltdown. He held a three-shot lead, drove right of the burn and instead of laying up he went for glory. His approach shot hit the grandstand and ricocheted backwards landing in knee-deep rough. On his third shot, van de Velde’s club tangled in the rough on his downswing and his ball flew into the Barry Burn. He took off his shoes and contemplated playing out of the water, but sanity prevailed and he took a drop. His approach finished two metres from the cup. He made the putt for a triple bogey, which put him in a playoff with Scot Paul Lawrie and Justin Leonard. Lawrie won the playoff. At Royal Troon, Grady opened with rounds of 68-67 to lead by two and after a third round 69 entered the final round one shot ahead of Tom Watson and eventual winner Mark Calcavecchia by three. Grady carded a respectable 71, but Calcavecchia’s 68 and Greg Norman’s 63 resulted in a three-man playoff. It was the first playoff at the Open in 14 years and the first use off the four-hole aggregate playoff adopted in 1985. Going to the final playoff hole, Calcavecchia and Norman led Grady by two. Calcavecchia sliced his drive, but the ball was playable. Norman hit a super drive down the middle, but the ball bounced to the right and into a bunker. After Calcavecchia hit his approach to five feet, Norman gambled from the bunker and the ball smashed into the bunker’s face and limped into another. “Zinger” let the 1987 Open at Muirfield slip through his fingers. He led Nick Faldo and David Frost by a shot going into the final round and was three ahead of the field after eight holes. On the back nine, he missed a few makeable putts, but his biggest error was taking driver on 17. He found the fairway bunker, had to chip out sideways and made six. Then on the last, he took an iron for safety and missed the green with a five-iron. Azinger finished in a tie for second with Rodger Davis. Faldo parred all 18 holes to win by one stroke. At Carnoustie, Jack started with steady rounds of 69-71 and then equalled the Open record with a 65. That put him one behind South African Bobby Cole entering the final round. On the final day, the wind arrived and at the 16th, a tough 207m par-3, Jack failed to make par. He misjudged the wind on 17 and dropped another shot. Newton needed a par on the last to tie Tom Watson. Jack made the putt and the 18-hole playoff. After three holes, Watson led by two but Jack got back to level and went ahead at the 12th. On the par-5 14th, Jack was stone dead for a birdie but Watson chipped in for eagle. Both hit good drives on the last, but Newton hooked his approach in a front bunker. Watson was on the green and rolled his putt stone dead. Jack’s sand shot left him with too much to do and Tom won his first of five Open Championships. In gusty winds during the final round at the Old Course at St Andrews, Sanders saved par from the Road Hole bunker and led by one going to the 72nd hole. After a lengthy drive on the short par-4, he took four shots from just 68 metres and missed a downhill putt for par from one metre to win. He missed and went into an 18-hole playoff against Jack Nicklaus, which he lost by a stroke. Dave Thomas couldn’t stop Peter Thomson winning his fourth Open at Lytham. Still, the Welshman did have opportunities on the final day but blew it with three putts at the 10th, 11th and 12th. He took a one-stroke lead on 15. At the par-5 17th, Thomas had a seven-iron in, but pulled it into deep rough and took a five. He parred the last to tie with Thomson, but he was no match for the Aussie in the playoff. Three times the Welshman finished second at the Open (1953, 1954 and 1961). In 1950, he finished third and in 1946 was fourth. Poor crowd control at Lytham in 1958 might have cost the Irishman victory. Fans were crowding the 18th and, after a lengthy wait, O’Connor decided to take a three-wood rather than driver. He felt the hole was driver and wedge, but he took three-wood, hit it in a trap, made five and finished runner-up. The American held a five-shot lead going into the third round at Royal Troon. Despite shooting a third round 78, which included taking three to get out of the bunker on the sixth, he held a one shot lead at the start of day four. His final round 77 wasn’t good enough and Tom Watson won his fourth Open.